Almost nothing was known about who had built the great cities of Trepu, or of the devastating war that had laid them waste. The ruins were silent, and within them no life remained. The complex chain of events that would lead to a new battle for Trepu was set in motion, quite unknowingly, by one Professor Xanthan Prendergast of the Exobotany Department of the University of New Terra. While on a field trip to The Fringes, he had explored the ancient capital of Trepu, and there had found a seemingly unremarkable red flower. He kept a sample, and some months later wrote a rather dense and uninteresting article about it in the Imperial Journal of Alien Flora. Almost no one read it. Almost. The article was perused by a lowly intelligence analyst in a small windowless cubicle deep within the Imperial intelligence centre at Langliton. It took a few minutes before it all registered. A flower. Growing in a city. 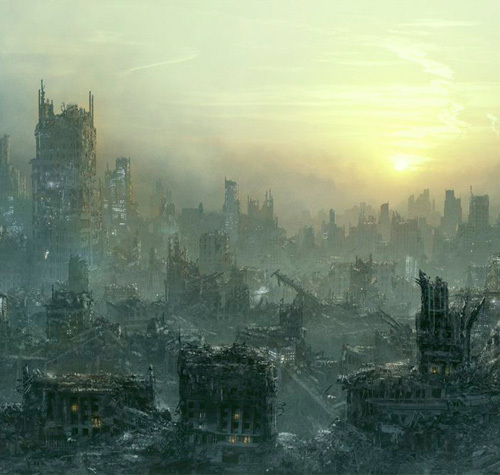 A city blasted by intense Goatronium radiation, where nothing would be expected to survive. She excitedly sent a vidmail to the Subdirector of the Anomolous Items Division of the Fringe Analysis Directorate. The SubD/AID-FAD the sent it on to the Assistant Director, who sent it on to the Acting Deputy Director, who forwarded it with several attachments to the other divisions. Powerpoint slides were produced and a meeting was held in the boardroom in the uppermost tower of the complex. This flower, bulbophyllum goatroniux, might hold the secret to developing a cure to goatronium radiation sickness, or even genetically engineering radiation-proof Space Marines. With the utmost secrecy, a scouting team was dispatched. Their instructions: to retrieve a sample–and prevent anyone else from doing so. Returning home from work, the SubD/AID-FAD peered into the mirror in his small, oddly furnished quarters. Unlike most of the tennants of the condominium complex where he dwelled, the SuBD had pulsing ooze climbing his walls rather than bookcases filled with rare books or the latest in refined musical tastes. It had been a year now since he had been infected, and as he dabbed at the greenish splotches on his skin with flesh-coloured pancake makeup, he wondered how much longer he could continue to serve Chaos by passing on Imperial intelligence to his demon masters. The SubD looked through the reports he had smuggled out today. The one on the flower seemed oddly important. He scanned and uplinked it, then went back to touching up his makeup. In a corner of the apartment, a cockroach scurried to the wastepaper basket. It seemed much like any other cockroach, unless one took a close look at its razor-sharp claws, its biotoxins, or its other Tyranid features. With little mind of its own, it did as it had been bred to do, clambering over the discarded papers and memorizing the marks upon them. When its task finished, it scuttled under the door—off to meet its synapse task-master in a nearby sewer, to serve the hive-mind by delivering the data it had collected. Four players in a mini-tournament–winner gets a free dinner. Urban combat, randomly selected mission and deployments, 500 points per side. Losers buy the dinner for the winner. Table and excellent scenery courtesy of BD Cosmos. Tyranid ripper swarms and gaunts charge forward, supported by a Malenthrope and something else big and nasty. Orks field a large unit of shoota Boyz, a smaller unit of choppa Boyz, and a small unit of Burnaz led personally by Glarsnot Bloodcurdle. Orcish shooting does less damage than anticipated as Ripper Swarm dodges from crater to crater. Swarm and Malenthrope slam into the shoota Boyz, followed by the first wave of Gaunts. Miraculously, the Boyz hold. The Burnaz join the fray, setting their weapons to “cut” and slicing up the Malenthrope. The Swarm is killed, and the Gaunts flee. The second wave of Gaunts approaches. The Burnaz step forward, and hose down the massed Tyranids with flame, scoring a record 42 hits. 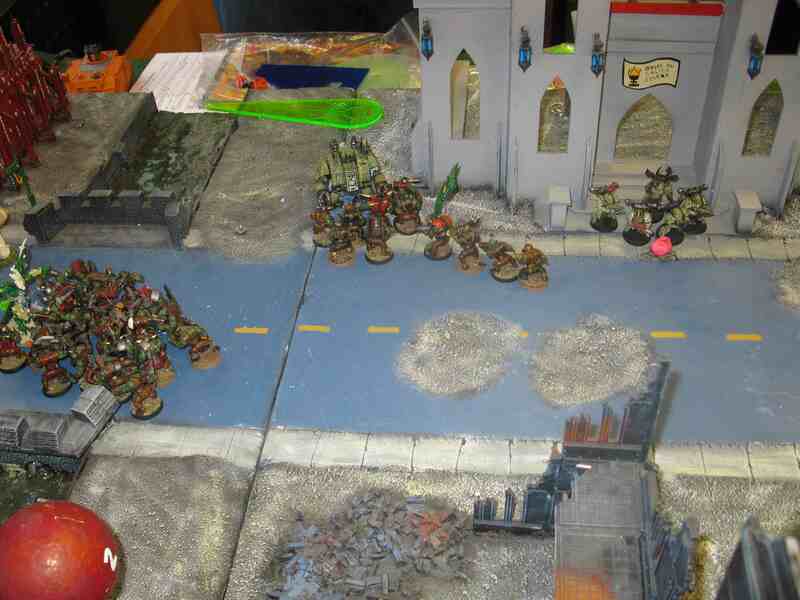 The surviving Tyranids withdraw, leaving the Orks in possession of the battlefield, and a prized red flower. The Space Marines deployed far back in a building. This proved to be a problem as it hindered his mobility. My Daemon Prince took out his HQ, a 5-man tactical squad, and being able to fly around was great for mobility. He was able to jump up and assault the HQ and squad on round two. Strategic placement of troops also allowed them to stay close to objectives without getting fired at. The Dreadnought didn’t do too much, other then a bit of damage to a Sternguard unit. 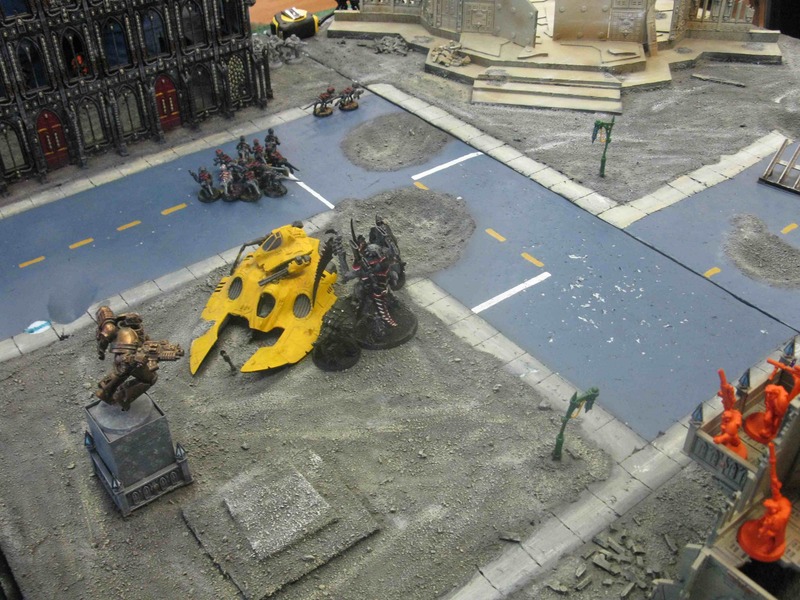 But he was a big deterrent from the Space Marines’ leaving their building without him going down…. We thought we had them in our crossfire, Sir… our scouts were well positioned up in the buildings. But they kept coming. They kept coming.. hordes of them, endlessly, with teeth and claws.. ripping.. shredding… we fired until our weapons overeheated, our ammo ran low.. but still they kept coming. Our shots just seemed to bounce off the larger ones. Ad the screams.. the screams of the creatures, the screams from our squads as they were torn limb from limb.. by the Emperor… I can hear it in my head… blood everywhere… make it stop, please Sir, make it stop… arghhhhhhhhhhh…..
Interview ends. Patient recommended for confinement and treatment. All news of this mission is to be restricted at the Top Secret level. His scientific curiousity piqued by the discovery of bulbophyllum goatroniux, the Orks are joined by Mad Dok Grotsnik. 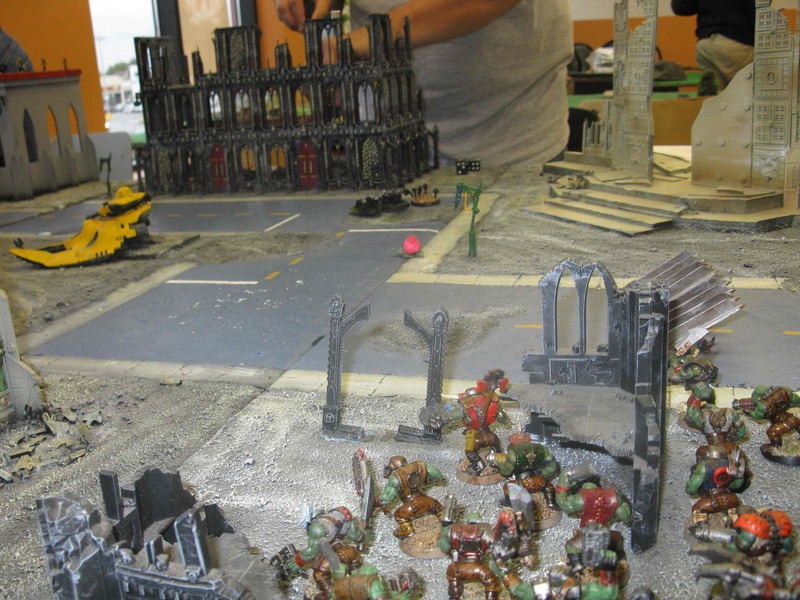 Taking personal command of a large unit of choppa Boyz, he explores the western side of the city. A smaller unit of shoota Boyz and a Deffkopta support him. Soon, they encounter their opponents: two squads of Chaos Marines, supported by a Dreadnought and led by a huge, winged Demon Prince. The Mad Dok devises a cunning and complex tactical plan. He’ll take his large mob of Boyz, run up to the enemy, and kill them all. As he does so, the shoota Boyz moove up on his right, and the Deffkopta darts from place to place firing rokkits at whatever it can see. As the Dok and his Boyz round a corner, the Demon Lord charges them. He wounds Grotsnik, but fails to kill him on the first round. The rest of the Boyz pile in, as does a unit of Marines. Grotsnik dies. The Demon Lord falls to a Nob’s power klaw. Finally, after several rounds, the Marines are killed and the Orks emerge triumphant. In the meantime, the shoota Boyz charge the Dreadnought, immobilizing it. The latter clearly failed to have its close quarters combat software updated, and in three rounds of fighting manages to kill but a single Ork. The remaining squad of Chaos Marines exit the building where they’ve been skulking (err, “seeking tactical advantage”) to secure one of the rare red blooms. One dies to a rokkit from the Deffkopta, and the surviving choppa Boyz charge them, wiping them out. The overall winner was the Orks, and Warlord Glarsnot Bloodcurdle of Da West End Boyz later feasted on the skulls of his opponents (well, beer, French onion soup, and a burger). It isn’t originally our image. 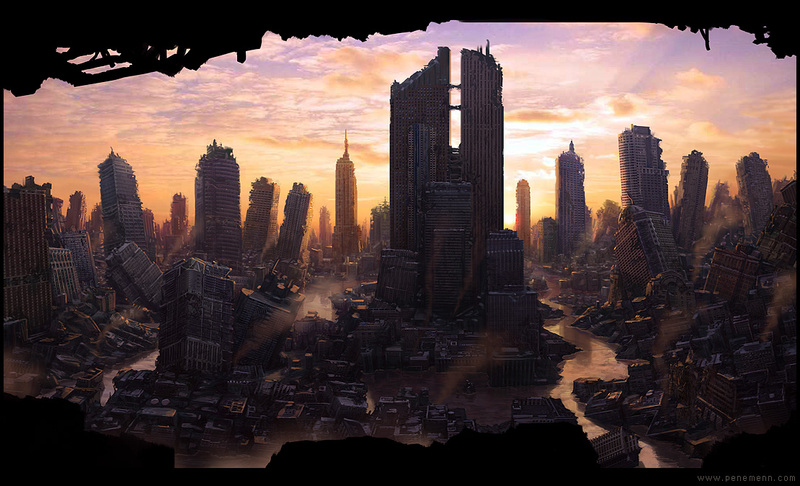 Can you let me know where you go the image of the ruined city from, or who has the rights? As noted in the previous reply–no, I don’t know where the original image is from. Damn! No one knows, this is the third site I found with it. Thanks anyway though.